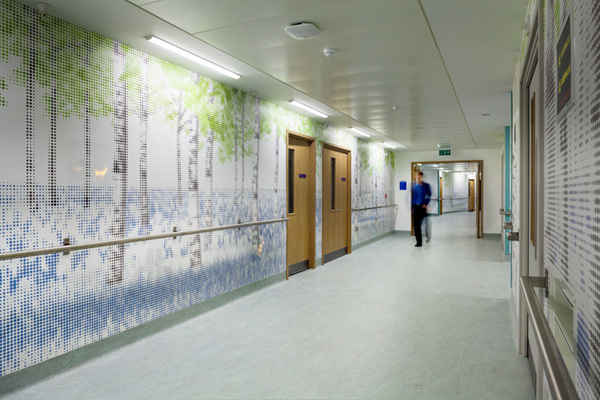 Within the Great Ormond Street Hospital in London is an interactive installation by Jason Bruges Studio. The “Nature Trail” is located in the Morgan Stanley Clinical building as part of the Mittal Children’s Medical Centre. 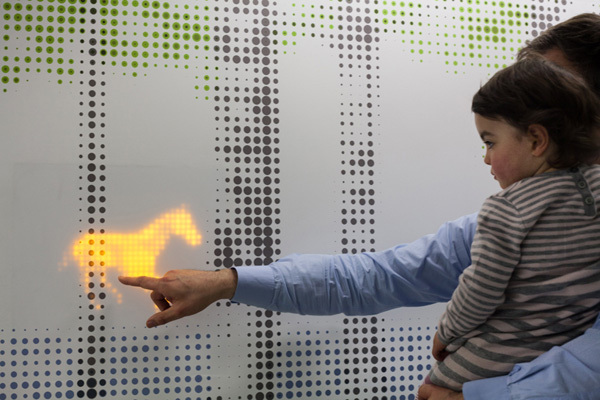 It is interactive artwork that is meant to provide young patients a distraction from impending medical procedures. The digital canvas is a forest with scenes depicting various ‘forest creatures’, including horses, deer, hedgehogs, birds and frogs. The space integrates LED panels and bespoke graphic wallpaper. Motion sensors detect patients passing through, causing LED forest animals to appear. As the patient moves down the hallway, the pixelated LED animals pop up and move around, darting through trees and foliage. The artwork consists of 70 LED panels, with a total of 72,000 LEDs.